https://youtu.be/nh5rx_dA4HU new YouTube video – excuse the terrible hair! The combustion of Uranus in the first chart and the overlay of the second lead me to believe this is just the tip of the iceberg in terms of tempers flaring, power shifting, turmoil brewing and the seeds of revolution starting to be watered. I fear a civil war or at the very least extreme civil unrest is percolating. I tried to make a video yesterday but had a technical problem. I’ll put something up soon. 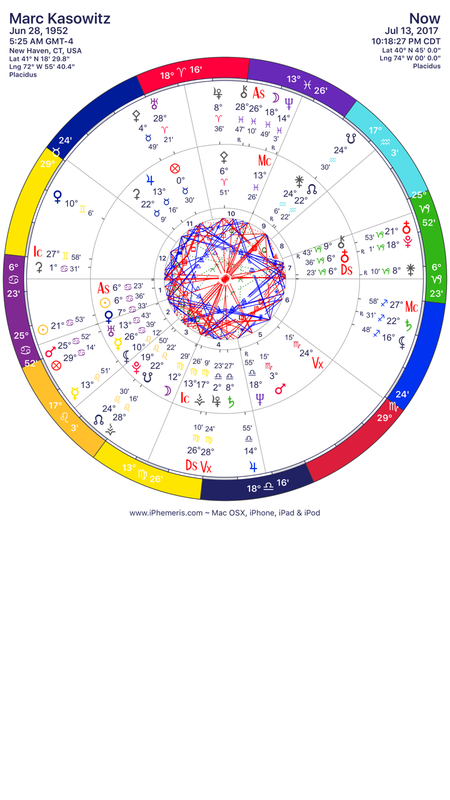 As you can see in the chart below transiting Venus is making a conjunction to DTs natal Uranus and making an exact inconjunctions to transiting Pluto in the 5th. 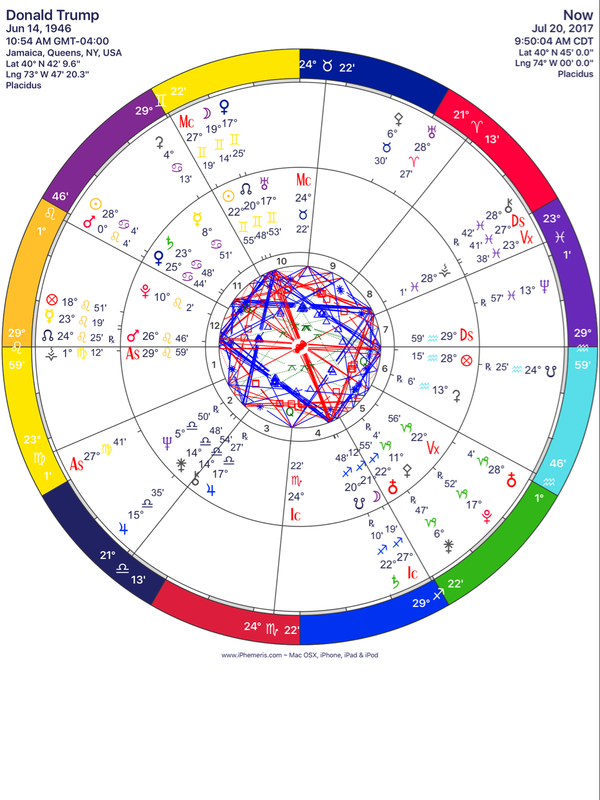 The reason this is so significant is because that transiting Pluto inconjunction has been wrecking havoc for Trump and is now lit up by Venus- basically Venus is setting that aspect off. We can expect now (as we are discovering in the press) that following the money will be key to potential criminal wrong doing. It’s very likely that Mueller and his team have already discovered “inappropriate” financial dealings between Russia and Trump. With Pluto in the 5th it’s very likely his kids (and this includes his son-in-law) will sink him and his empire. If he makes the mistake of firing Mueller I think he’s aware this would accelerate his demise. Look for him to continue his negative campaign against the investigation and as he attempts to save himself, watch him tear a hole in the fabric of our country. Well, for those who are interested in this new character in the Trump saga – here is the hair trigger lawyer’s chart. All I can say is we are still at the tip of that iceberg – it only gets worse from here. As you all know I have been freaking out about North Korea hitting the US, especially CA and more specifically Southerrn CA, for awhile now. I had seen a vision of 4 yellow balls of light and the next day while doing a reading, I saw a flash of red and my thought was- “oh, great another missle launch by North Korea.” Then I quickly forgot about it as I went into a full work load and it passed out if my head until last night when it happened and the warning came back. 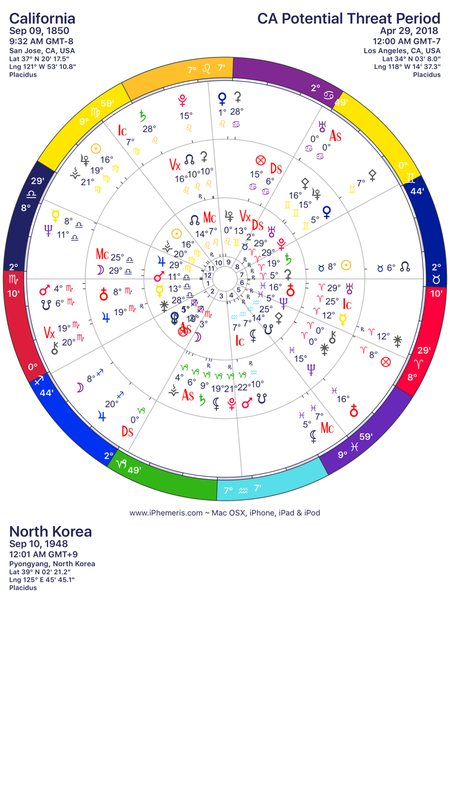 I couldn’t remember the time frame I had looked at for the potential attack on CA by North Korea so I found it in my system and am putting the chart out there for others to analyze. 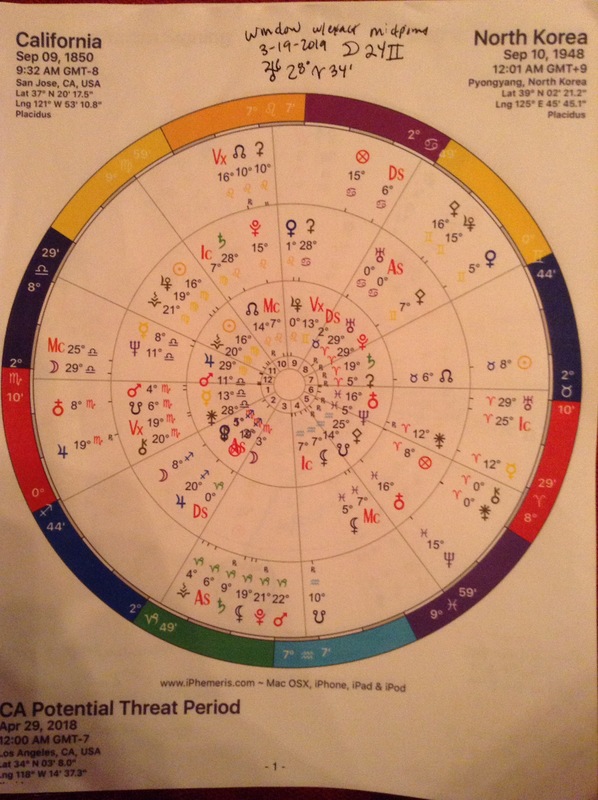 The exact date of course will not be accurate, but if you look at the outer planets during the spring of next year around the time I picked for the chart you can see how scary this could be. Here it is for all of you to deconstruct and meditate on. Great Spirit bless you and all the people of this world.